That’s right, we’ve got some fresh footage for you here from Japan, courtesy of GoNintendo. 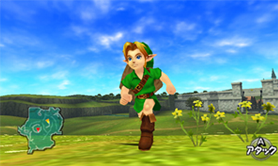 The first video is the Japanese overview trailer of Ocarina of Time 3DS. The second video is a Japanese commercial for the game. Step inside for another look into Ocarina of Time 3D. Check out this new post for Dathen’s impressions of the videos.